During this Chinese New Year, more than a billion people will be welcoming in the Year of the Black Water Snake, celebrating with family and friends all week long. The previous Year of the Black Water Snake was in 1953, which was when China launched its first Five-Year Plan and the average annual income for a family in the U.S. was about $4,000. As the Dragon took its last breath of the year, it exhaled plenty of fire into China: Looking at year-over-year data as of the end of January, new bank loans, passenger car sales and exports all rose while inflation was slightly lower. Imports of key commodities we track, crude oil, aluminum and copper, were also exceptional, with month-over-month increases of 6 percent, 4 percent and 3 percent, respectively. Increasing money supply and easing policy in China have also helped to breathe life back into China's equity market. Below is an update of the chart we showed Investor Alert readers back in October when the venomous sentiment toward China was at extreme levels. We believed Chinese stocks were significantly undervalued compared to emerging markets and that its equities were due for a rebound. I indicated that an increase in money supply would be the needed oxygen for an equity resurgence. Over 2013, we expect the government to continue its accommodative efforts, which should reinforce the equity rally. In addition, the new pyramid of power is focused on growth, as it seeks to improve and reform policies that will provide its residents with opportunities and social security, increase incomes and raise standards of living, which should encourage domestic consumption. Growth is set to be considerable over the next several years: Jefferies Equity Strategy team anticipates that China's GDP will grow at a compound annual growth rate of 6.9 percent and by 2025, will almost equal that of the U.S. In addition, China's GDP per capita is projected to climb to about $18,000 on a purchasing power parity and domestic consumption is likely to make up a larger portion of its GDP, jumping from about 49 percent in 2012 to 73 percent of GDP by 2025, says Jefferies. To achieve these goals, there needs to be significant reforms to promote a "new urbanization." While China has been anticipating the rise of urbanization by building out the country's infrastructure of medical services, housing, water, high speed rail system, and roads, the mobility of many residents remains restricted by its internal residence status, called the hukou (pronounced "who-cow"). First put into place in 1958, the hukou system was a means of controlling migration throughout the country. It designates where a person or household may reside by geographic area. According to J.P. Morgan's Jing Ulrich, "the system's primary function was to maintain a sufficient agricultural labor force, while preventing excessive strain on urban resources." Under this registration system, if a resident does not have an urban hukou, the family has no access to social benefits such as free education, health care and pensions that are provided to permanent residents of that city. Michael Ding, portfolio manager of the China Region Fund (USCOX), was raised in rural Dalian and remembers what it was like living under the registration system, which he says was driven by the government's need to ration food. Still fresh in leaders' minds were memories of millions of people dying from starvation, and the government wanted to ensure there was enough food for urban residents. With this upbringing, Michael developed a knack for quickly understanding rationing systems, as his family was unable to purchase additional food regardless if they had money or grow vegetables in their backyard. So while it was reported that more than half of China's population lives in an urban area, only about one-third of the total population holds an urban hukou. Andy Rothman from CLSA calls these roughly 250 million migrants "quasi-urbanized," which means that one worker lives in the city, while the rest of the family remains in the rural home. This equates to a real nationwide urbanization rate of only about 35 percent. You can see in Jefferies' chart how the official urban residence status differs across the country compared to the urbanization ratio. If the government reforms the hukou, it is estimated that 600 million people might move to the cities over the next 20 years. This includes 300 million migrants becoming "new urban residents" and 300 million rural residents moving to urban areas by 2030, says Citi Research. According to its data, "urbanization could bring another 150 million surplus rural laborers to the cities." "[P]otential reforms in hukou registration and healthcare systems together with extended substance allowance will likely encourage more migrant workers to live in cities for the long term with higher consumption propensities," says Morgan Stanley. Because urbanization is a big driver for the housing market, CLSA believes property sales in China's 600 third-tier cities could significantly benefit from hukou reform, as about 100 million migrant workers currently reside in these cities. The government has begun to factor in the massive ramifications of these families moving to the cities. According to J.P. Morgan, "investments in urbanization are already placing a heavier emphasis on the human benefits of development." Regarding social housing, in 2012, the country met its goal of starting on 7.2 million units and completing about 5 million units, according to the research firm. For 2013, China's plans call for an additional 10 million units that will be under construction or complete by the end of the year. 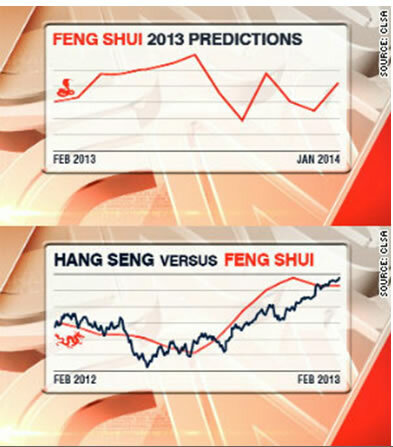 What to Expect in the Year of the Snake: Bite or Might? Maybe both, if you follow CLSA's Feng Shui Index. Every year since 1992, CLSA Asia-Pacific Markets team takes a lighthearted look at the fortunes that may befall the Hang Seng Index. During the Year of the Dragon, CLSA's predictions of the Hang Seng Index came amazingly close to how stocks actually performed. Equities in China fell into a bit of a slump toward the beginning of the year. Then the Dragon woke up and fired up the markets toward the latter half of the Chinese year. Over the next several months CLSA foresees Chinese stocks to slink like a snake, rising in the beginning of the year before sidewinding in the latter half of the year. According to CLSA, the elements fall out of balance, as "the crucial Fire element all but dies away, Earth falls, Metal overshoots and Water puts a damper on prospects." Don’t miss the presentation that received more than a quarter-million page views on businessinsider.com. To download your copy, go to www.usfunds.com, follow us on Twitter or like us on Facebook.